There is a good reason why we only make RainSaucers™ and not Rain Barrels . It's because the general public has now caught on to the fact that anyone can make their own rain barrel for under $35. No need to buy one for up to $200 from your local nursery. All you need is a recycled barrel or cheap trash can, a bulkhead fitting or grommet, a faucet, and some other minor hardware. It's so straight forward that you can now choose from a variety of kits which take you through the entire process. These kits are everywhere online and even at Walmart. The upswing in rain barrel kits has been a great enabler, not just for end users, but for municipalities and nonprofits trying to promote water conservation. It seems like almost every week there is a rain barrel giveaway, workshop, or subsidy program announced- all relying on DIY RB kits or something similar. Yet while this trend has been great for water conservation, it has meant a big decrease in new Rain Barrel Sales. We know this from our conversations with major online gardening websites and garden centers. One well-known garden supply website which ranks in the Top 5 on Google search for "rain barrel" told us last year "rain barrel sales are in the toilet". This trend has mainly been a good thing for our startup. 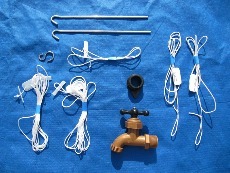 Since we make our own rain barrel kit and offer the RainSaucer™ as its own DIY kit, our Sales have continued to grow. But when we mention that to garden centers (where rain barrels have historically been sold) they are usually incredulous, having had a bad experience with rain barrels. A good example is a nursery we recently spoke to in Livermore, CA. Their owner was initially so excited about rain barrels, he bought a whole pallet of the terra cotta vase style. Years later his nursery still hasn't gotten rid of all the units, in spite of deep discounting. So we can see their logic- rain barrels don't sell so why should other rainwater harvesting equipment. To us that's like throwing the baby out with the bath water (which could easily be clean rain from our system BTW). Instead, they should just embrace the DIY rain barrel kit revolution.